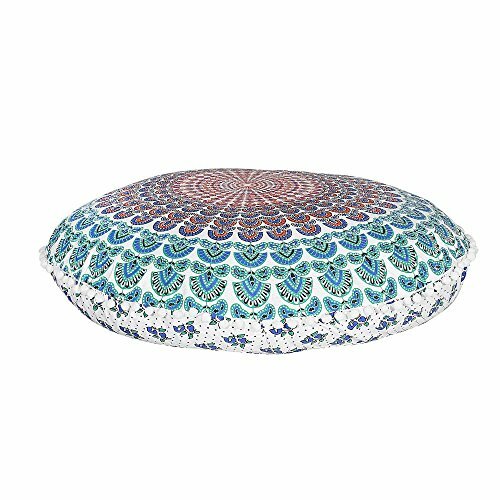 This beautiful screen printed floor pillow is the perfect way to add extra seating that's fun and funky. Handmade by artisans in Sanganer, this bohemian style floor pillow is made from the mandala and medallion inspired tapestries that we also carry. You will receive this product unfilled, for easier shipping. You can easily fill it with fabric scraps or any filler material of your choice. Toss a few pieces around to add more seating to any space, from the formal living quarters to your entertainment room. Size 32 in. (80 cm) diameter Material 100% Cotton Weight 0.200 Kg ( 8.81 Ounce ) Place of Origin Sanganer - India Care Hand wash separately recommended; don't soak, or machine wash on cool; gentle cycle; tumble dry Note Cover only; insert not included How to Fill Easily fill from bottom opening with polyfiber or polystyrene (used in bean bags), cotton, scraps of fabric; or pillow inserts can be bought online. If you have any questions about this product by Labhanshi, contact us by completing and submitting the form below. If you are looking for a specif part number, please include it with your message.